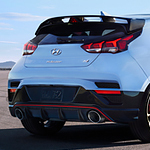 The Hyundai Veloster is a vehicle that has a sleek design and delivers exceptional performance. When you drive this vehicle, you have a choice of several different engines to choose from. This is a vehicle that is in the top of its class when based on performance. The Hyundai Veloster has a 2.0-liter four-cylinder engine. This engine puts out 147 horsepower. You can count on this vehicle to deliver the power you need for nearly every driving situation. The Hyundai Veloster comes with a six-speed manual transmission. A six-speed automatic transmission is available with the base engine. If you want a transmission that is a bit more advanced than the six-speed manual transmission and the six-speed automatic transmission, a seven-speed dual clutch automatic transmission is available in non R-spec turbo models. You can count on this vehicle to get an estimated 27 mpg in the city and 34 mpg on the highway.